#3 and #8 are amazing! Wish I had more space in my apt! I love that duck leg mirror. Too cute! i'm a new follower :) LOVING all this gold. that hudson table is FABULOUS! Wonderful round up - especially love the mirror and chic table!! That Hudson table is just perfect, would also make a great bar/ serving cart! Love #1, #3 and #8!! Great round-up! Yes, yes, yes! It's all I can say. I love this post and I'm loving the gold!! i love the bowl and flatware..so chic! I am really into gold right now. So pretty! Thanks for sharing these awesome finds! 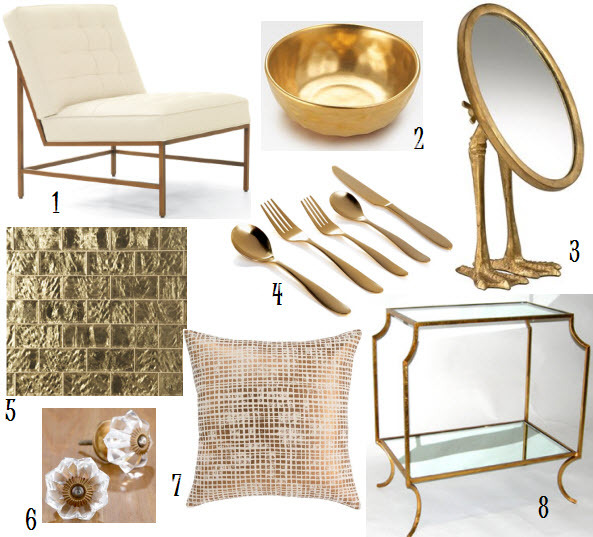 I'm not normally a fan of gold, but this roundup is making me think twice! Pretty finds! I'm in love with that table! I L-O-V-E that table. Doesn't go with my house style at all, but its so very awesome. I love the table, and the duck mirror. Itching to use some of that Gold Glass Ann Sacks Tile for a client! Love all the gold! that table is divinely sparkly and gold, love it!!! that chair wants to live with me! weird. JUST as i was reading the title of this post i was picking my nose. i will take the loren table please. Gold and chrome... my new addiction! I love gold. that Gold Glass Tile is breathtaking and I love that Loren Table as well as the Glass Pulls. Gorgeeeeeousssss! I really think there's something 'afoot' in your selection of gold items. The duck feet prevent the arrangement from becoming too stuffy.